Safely and effectively shipping product from a factory or warehouse to a customer or distributor can be frustrating and costly. Loosely stacked or hand-unitized pallet loads can shift or topple, product can be damaged, and rain and bad weather can destroy packaging and ruin contents. 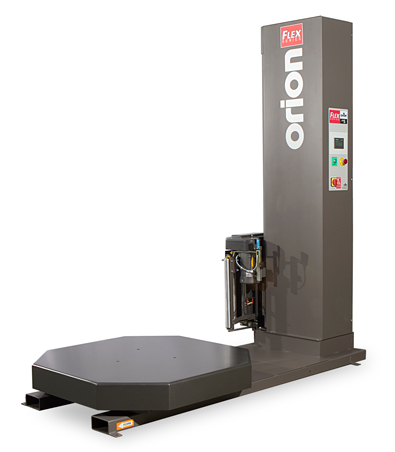 Stretch wrapping machines can minimizes these issues while lowering distribution costs. The tight load unitization that comes with stretch wrapping improves load handling, increases worker efficiency, boosts workplace safety and helps ensure products arrive safely. Stretch film often replaces more expensive forms of pallet packaging such as strapping, corrugated, or heat shrink film. Companies that hand-wrap pallet loads or use other, similarly ineffective containment methods, are discovering improved efficiency and savings through stretch wrapping technology. Companies that use steel or poly strapping to secure loads also will find improved efficiency and savings. While bands can loosen during shipment and can require re-tightening, re-palletizing or re-banding, stretch wrapped loads maintain consistently tight containment. Injuries common with the banding process and hand shrink wrapping are greatly reduced through stretch wrapping automation. Fully automated stretch wrappers can reduce the number of employees and time needed to unitize each pallet load. Overall, automatic stretch wrapping machines can improve product protection, maximize unitization, and minimize packaging costs per load, including labour costs and stretch film costs. With automatic stretch wrapping, the machine prestretches the stretch film to increase strength, resistance to punctures, and load holding power. Prestretched film is then wrapped around the load by either rotary, turntable or horizontal wrapping systems. Rotary tower machines rotate the stretch film around a stationary load. Turntable models turn the pallet load on a turntable while the film carriage moves up and down on a mast. Horizontal wrapping systems can wrap longer loads that do not fit on a pallet. For the horizontal wrapping systems, the film carriage is mounted to a ring that rotates around the product as it passes through the ring.